The US State Department announced that Washington would suspend its INF treaty obligations in 60 days unless Russia returns to full compliance. Radio Sputnik discussed this in more detail with Dr Mark Gubrud, adjunct assistant professor in peace, war and defence at the University of North Carolina. Sputnik: What is your take on the conditions that were put forth by the United States, by Mike Pompeo? Is this a typical Trump deal-making approach, or do you see something deeper at the root of this? Dr Mark Gubrud: I wouldn't say it's a typical Trump approach at all, but it represents a tension between forces within the administration which are, on the one hand, hoping to save the INF treaty, and on the other hand, trying to break it. These are different people pushing in different directions. I think this general perception that National Security Advisor John Bolton is interested in destroying as much arms control as he can and has probably pushed the president to move in this direction, but there are forces within the US government that have been pushing this for a long time, and there are others who would hope to take a more measured approach and try to save the treaty. Sputnik: Who is interested in saving the treaty at this point in time? Dr Mark Gubrud: Is it possible to save the treaty? I think it is; it's a question of political will and I don't know if that will is there on either side. But I would think professionals within the State Department have been trying to save the treaty. 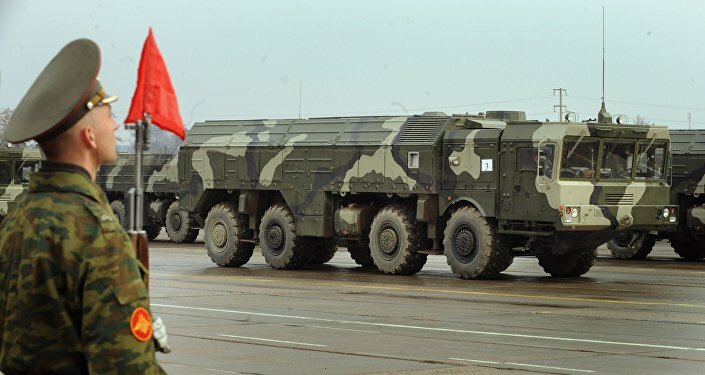 The United States has been noting the Russians testing this missile, this disputed missile, whose Russian designator is 9M729 and NATO calls it the SSC-8, but this has been tested and developed since 2008 and the US has repeatedly raised the issue with Moscow and hasn't really gotten anywhere. Bolton may have seen this issue sitting there on the shelf and saw an opportunity to raise it and got the president to make a statement that we were going to walk out of the treaty. READ MORE: US's INF Move Could Prove Fatal for Arms Control Treaties — Int'l Law Assoc. What needs to happen is that the two sides need to put together expert parent panels to come together and discuss this and see if we can come to some agreements about what the facts are. Eventually, there is going to be a political decision; I don't know if Russia will change its position, but I think there should be an expression of willingness on both sides, I think, to further engage and see what we can do. Sputnik: Can you talk about what consequences will ensue if we do see the US unilaterally pulling out of the INF treaty? Dr Mark Gubrud: From the United States point of view, almost nothing will change on the US side, but probably Russia will then be free to go ahead and continue to deploy more of these same missiles and others with intermediate range, which are more useful to Russia than to the United States. As far as extending the treaty to China or other countries, the same problem arises that different countries are at different geographical situations, and basically, the INF treaty would ban a huge number of China's missile force and they're just not going to agree to that. Sputnik: They've already come out and said they're not going to do that. But many people are saying that actually China was the target of this, they were hoping that Russia would put pressure on China in some way? Dr Mark Gubrud: That may be somebody's thinking, I don't think that's good thinking at all, for a number of reasons. First of all, again, the United States is not likely to be able to base large numbers of intermediate-range missiles, either in Europe or in any of our Asian allies, that would threaten China. Rather the US tends to base these things on submarines and ships at sea; that has the advantage that you can move them wherever you feel you need them at any given time. It's not likely that the United State is going to be able to take advantage of not having the INF restrictions by basing a lot of missiles on the ground that would threaten either China or Russia. And again, I think it's a good idea to try to include China and other countries in limits on offensive missiles. It's going to have to be different, you're going to have to look at the particular situation: what missiles are deployed, where are they deployed, and who are they threatening, then comes up with some kind of formula that balances the interests of each side — that's always the trick. Every side has to give something up and every side has to gain something in order to have a deal. Sputnik: Do you think that this move by the US to sort of put forward this ultimatum to Russia, which it is essentially is, is going to impact US-Chinese relations? Dr Mark Gubrud: I don't know how it impacts US-Chinese relations except that, yet again, it paints the United States as non-cooperative, as an aggressor. This move really does not make any sense from the point of view of US interests. One point of view on the INF Treaty is that the reason there's been no progress on this issue over all these years is that Russia would be happy to get rid of it, but it wants the US to be the one to make that call, it wants the blame to be on the United States. I don't know if that's true or not, but it certainly doesn't help the United States to be seen as the aggressor in this case, and as the one who's saying: "well, we're not going to talk about this anymore, we're just going to walk out". We need to indicate that we are open to further discussion and clarification of this issue, and to some solution that isn't just "you have to back down". The views expressed in this article are solely those of Dr Mark Gubrud and do not necessarily reflect the official position of Sputnik.